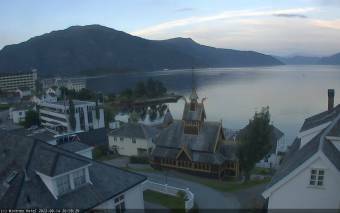 It's 04:52 in Balestrand, Norway right now. Sognefjord A view of the Sognefjord from the Midtnes Hotel. Svidalen: Traffic R5 (Frudalen), 17.2 miles away. Bøyum: Traffic R5 (Bøyadalen), 17.3 miles away. Senneset: Traffic E39 (Aarbergsdalen), 23.9 miles away. Amla: Traffic R5 (Kaupanger), 24.4 miles away. Vassenden: Traffic E39 (Vassenden), 24.4 miles away. Gudvangen: Nærøyfjord, 24.8 miles away. Herheim: Traffic E16 (Vinje), 29.4 miles away. AIDAaura: Captain's View, 30.8 miles away.